CAIRO — Canadian journalist Mohamed Fahmy, who has been imprisoned in Egypt on widely denounced terror charges, has been pardoned by the country’s president. A lawyer and Egypt’s state-run news agency said President Abdel-Fattah el-Sissi pardoned Fahmy today along with prominent human rights activists. The news agency MENA said el-Sissi has ordered those pardoned be released later in the day. Fahmy’s family expressed their jubilation at the developments. “Thank you to all the supporters sending us the news, we have heard and are very happy,” the family said on Twitter. Fahmy was given a three-year sentence last month after his second trial — an outcome that shocked international observers. The 41-year-old’s troubles began in December 2013 when he was working as the Cairo bureau chief for Qatar-based satellite news broadcaster Al Jazeera English. He and two colleagues were abruptly arrested and charged with a slew of offences, including supporting a banned organization and with fabricating footage to undermine the country’s national security. The trio maintained their innocence throughout, saying they were just doing their jobs, but after a trial that was internationally decried as a sham, they were found guilty and sentenced to prison terms. An appeal of their convictions resulted in a second trial, although one of them, Australian Peter Greste, was abruptly deported under a law which allows for the deportation of foreign nationals convicted of crimes. Fahmy gave up his dual Egyptian citizenship while behind bars in the hopes that he could follow the same path, but that didn’t happen. He and his other colleague, Egyptian Baher Mohamed, were, however, granted bail during their retrial, which culminated in last month’s surprising verdict. Following the verdict, Ottawa had formally asked Egypt’s president to pardon Fahmy or allow his deportation to Canada. The federal government said it was pleased at Wednesday’s developments and that it would continue to help Fahmy with his departure from Egypt. Al Jazeera is owned by Qatar, which has had a tense relationship with Egypt ever since the Egyptian military ousted the country’s former president Mohamed Morsi amid massive protests. Qatar is a strong backer of Morsi’s Muslim Brotherhood. Fahmy moved to Canada with his family in 1991, living in Montreal and Vancouver for years before eventually moving abroad for work, which included covering stories for the New York Times and CNN. Once he leaves Egypt, Fahmy has said he plans to take up a position as an adjunct professor at the University of British Columbia’s school of journalism in Vancouver. He has also been writing a book about his experiences. Notes on the chart above: Judgement happen as a super full moon builds (the first of three in a row). Note the square to Saturn, almost exact if 9 am is close to a correct time (it is only an estimate.) Note also that the moon’s ruler, Uranus, is also retrograde, and that Venus, ruler of the north node is also retrograde. Mercury has just entered Libra and crossed the north node, it will turn retrograde on Sept 17 and end retrograde on October 9 at 0 Libra. Mercury is technically in its shadow phase as it will revisit today’s degree (between Oct 5 and Oct 12). 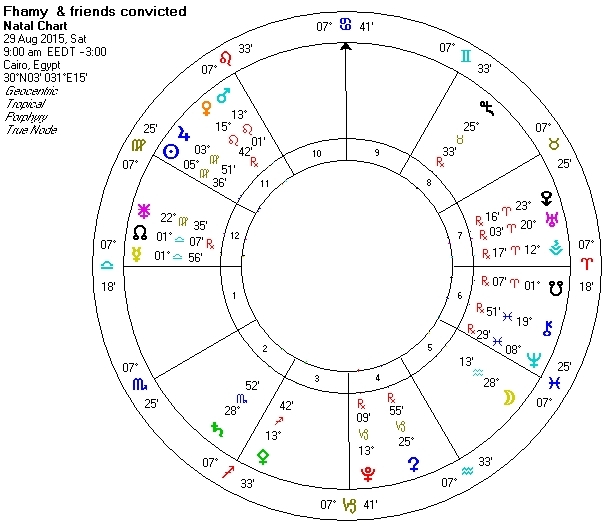 Venus, ruler and trigger planet of the north node (and also Mercury’s retrograde cycle), by direct motion will trine Uranus (ruler of the verdict’s transiting moon) on Sept 22. I suspect there will be some follow up action around this time. An Egyptian judge sentenced three journalists to three years in prison on Saturday in connection with their work for al-Jazeera English. At the end of their retrial, Mohamed Fahmy and Baher Mohamed were taken into custody from a metal and glass cage inside the courtroom at Cairo’s Tora prison. Peter Greste was deported to his home country of Australia in early February and was convicted in absentia. The case has been an illustration of the erosion of press freedom in Egypt in the two years since the military removed the country’s elected Islamist president, Mohamed Morsi, from power. Peter Greste speaks about time in jail and plans for the future. Judge Hassan Farid said that in his court’s view the men were not journalists. He then read out the sentences, which triggered a chaotic reaction in the courtroom as reporters, foreign diplomats and distraught family members rushed to leave the building. “I’m too shocked. My only hope is on deportation, because this is a joke of a trial. No process, nothing logical at all. Everything was pointing towards exoneration today,” said Fahmy’s brother Adel. Fahmy and his wife Marwa were accompanied in the courtroom by lawyer Amal Clooney. “I think it’s an outrage,” Clooney said outside the courtroom. “The Canadian ambassador and I are holding a series of meetings with Egyptian government officials where we’ll be seeking Mr Fahmy’s deportation to Canada and full pardon. Mohamed Fahmy’s wife, Marwa, was visibly distraught and said little as she got into a waiting car at the prison complex. While he had always feared there could be convictions for political reasons, Greste said this could have been done without additional time served, given the months already spent in prison. The Australian said he believed he was unable to appeal because he could not appear in person in court in Egypt, but said he would be speaking with his lawyer about how to proceed. “We will pursue any other legal avenue we have. The three men were arrested in December 2013 and charged with broadcasting false reports and colluding with the Muslim Brotherhood, which is now outlawed as a terrorist group in Egypt. They were detained following a raid on a Marriott hotel in Cairo. Footage of security agents interrogating Fahmy and Greste during the raid was later broadcast on television. Egypt’s pro-government media labelled the three the “Marriott cell”. Critics described the initial trial was described as Kafkaesque. As evidence, prosecutors played footage of a trotting horse from Sky News Arabia and a music video for the song Somebody That I Used To Know by Gotye. Despite of the peculiarities of the court proceedings, which were widely regarded as a farce, the three men were sentenced to seven to 10 years in prison in 2014. The verdict and sentences were widely denounced by foreign governments and news organisations. In December 2014 an appeals court ordered a retrial. After spending more than 400 days in prison, Greste was deported and Fahmy and Mohamed were released on bail in February. The prison sentences were unexpected. In previous court sessions, Fahmy articulated the possibility that he and his co-defendants could be cited for an administrative violation but acquitted of the more serious charges. During this year’s retrial key elements of the prosecution’s case unravelled in judge Farid’s courtroom. For example, a panel of experts ruled out the possibility that the journalists had broadcast fabricated news reports – a central claim made by prosecutors. Rights groups have documented a crackdown on media freedom in Egypt since Morsi’s overthrow in 2013. Following the military takeover, the state closed down some news organisations and arrested increasing numbers of journalists. In June 2015, the New York-based Committee to Protect Journalists reported that at least 18 other media workers were in prison in Egypt, the highest number since the group began its count in 1990. Fahmy has distanced himself from al-Jazeera, accusing the network of placing him and his colleagues in danger, lying about the channel’s legal status in Egypt and displaying editorial bias in favour of Islamists. He is suing the network for damages in a Canadian court. Seventeen people were originally charged in the case, including the journalist Sue Turton and producer Dominic Kane. They are also on trial in absentia after leaving Egypt. OAlongside them are two Egyptian students and an NGO manager who the journalists say they had never met before the trial. Update March 26, 2015 : The hearing has been delayed again, put off to the end of April. By re-trial time, Feb 12, Mercury retrograde will be over. 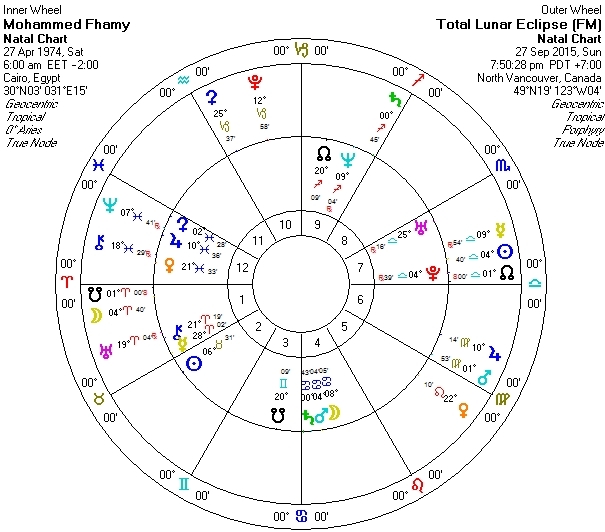 On that day, the Sagittarius moon conjuncts Saturn and later, squares Neptune. A few hours prior to the aforementioned moon aspects, Ceres in Capricorn perfects a ¾ square with Uranus. On Feb 13 the Sag moon trines both Uranus and Jupiter; they are move-it-along, freedom, or release transits. On Feb 14, the transiting sun trines Fhamy’s Uranus. Mercury and Jupiter are presently engaged in a transit that hit the “almost but not quite” mark as Mercury began retrograde on Jan 21. Mercury and Jupiter will finally surpass their opposition aspect on March 1. 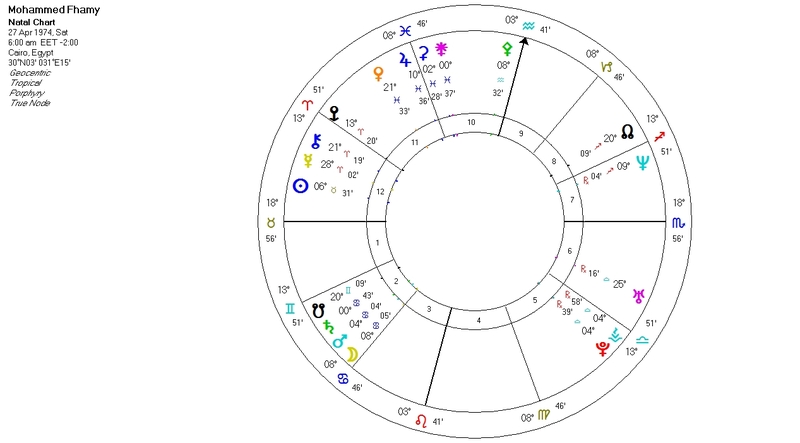 Note that the degree of this opposition (Mercury 14 Aquarius/Jupiter 14 Leo) is the same degree as the recent full moon of Feb 3. I mention this because the day before it was announced that Fhamy relinquished his Egyptian passport. As of yesterday’s court appearance, Fahmy is out on bail. Still, there is further to go. Feb 23 is the next scheduled court date. The transiting moon will be in Taurus, ruler Venus is in a 1 degree applying trine to Saturn, 1 degree separating conjunction from Mars. Update: the trial has been postponed to March 8. Fahmy is still not able to leave Egypt.